Gardendale, a small neighbourhood in West Texas, was hit with tragedy this week after 3-year-old Max Alan Shatto died. Local news reports suggest that Shatto collapsed outside his home on January 21st, and an autopsy is underway.Any time a child dies it is sad, but this death is unusual in that Shatto is an orphan. 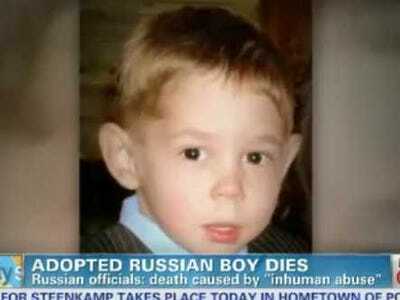 What’s more, he was adopted from Russia. Sadly, that makes this an international incident — one that could derail attempts to claw back a ban on U.S. adoptions of Russian orphans, and add fire to a neo-Cold War playing out between the countries. At the tail end of last year, Russia voted in a law that would ban the adoption of Russian orphans by American citizens. There had been a number of high-profile cases of abuse over the years — above all the 2010 case of 7-year-old Artyem Saveliev, who was adopted by a Tennessee family but then put on a plane back to Moscow with a “to whom it may concern” note allegedly pinned to his clothes after allegedly showing signs of violent behaviour. At least 19 Russian children were also thought to have died in recent years after their adoption to the U.S.
Now the case in Texas looks set to cause problems. The local Medical Examiner’s Office has previously stated the boy had bruises on his body, including his lower abdomen, but refused to speculate. The New York Times reports that the local child welfare authorities have received accusations of physical abuse and neglect. Russian authorities are also seeking the repatriation of Max’s brother, another orphan who had been adopted by the Shatto’s at the same time. TV channels are devoting hours of time to the case, and parliament held a minute’s silence for Max. The adoption ban was widely seen as an anti-Western move by Vladimir Putin’s Moscow elite, a chance to punish the U.S. for its blacklist of Russian officials linked to the death of Moscow lawyer Sergei Magnitsky. Russian critics of the plan point out that U.S. adoptions can literally be a lifesaver for disabled children — one blind teenager wrote a widely-circulated letter calling on Putin to adopt 5-10 disabled children personally. A protest in Moscow managed to bring out tens of thousands of people against the ban. However, even opponents of the ban admit it is popular in Russia. Last month Business Insider spoke to Pavel Khodorkovsky, the son of the jailed oligarch Mikhail, who said that few Russians really knew the full facts of adoptions in the U.S., or the true horrors of Russia’s orphanage system. The effect of this story is two-fold. First, it helps neuter the arguments of those in Russia who have protested against the ban — it’s virtually impossible to argue with the death of a child. Secondly, it adds fuel to the fire that created the ban — a widespread anti-Americanism in Russia that is only likely to grow.